Jessica Kemmerer has joined our customer service team at ProtoCAM! She has taken on the role of Administrative Assistant here at our facility. Kemmerer was looking for a challenge in a new industry and ProtoCAM was prepared to provide her with just that! Her background includes extensive work in healthcare and as well as administrative experience at a nonprofit organization. Though she already has an associate’s degree in medical assisting, Kemmerer is also currently taking additional college courses as a way to remain intellectually engaged—and also in order to advance her skillset here at ProtoCAM. “Right now [my classes] are paralegal-type programs, but…I’ve had discussions with [members of ProtoCAM’s customer service team] about what business courses would be helpful in my career at ProtoCAM,” said Kemmerer. Additional business courses will contribute to Kemmerer’s continued knowledge and experience as she grows in her administrative role here at ProtoCAM. While she has experience in administrative duties, the world of manufacturing and 3D printing is new to Kemmerer. “It’s interesting, and it’s neat seeing the final products,” Kemmerer said. “It’s all been a learning curve for me…so that’s been the hardest part, but everyone here has been so helpful.” Kemmerer is excited to continue to learn about each process ProtoCAM offers, from Fused Deposition Modeling (FDM) to Multi Jet Fusion (MJF). 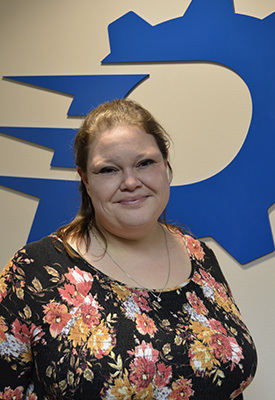 Kemmerer’s goals as administrative assistant include providing high levels of customer service to all of ProtoCAM’s customers as well as simply radiating a sunny disposition in the office. “I’m hoping just to bring a friendly face, a nice positive outlook, and a team work approach,” Kemmerer emphasized. Outside of ProtoCAM, Kemmerer is often found engaged in family time and spending time with her friends, husband, and four cats. She also plays several instruments and sings and writes her own music. Kemmerer is looking forward to continuing to transition into her role here at ProtoCAM and fitting in as a member of our team of experts. “We’ve got a really good team here and we’re really passionate about what we do. We value everybody using our business,” Kemmerer affirms. “I really think it’s a great team and I think anyone who does business with us is making the right choice by coming to ProtoCAM.” Welcome to the team!